The longest ruck in our July challenge is TONIGHT – Tuesday July 24th at 7 PM. It’s going to rain all week, and probably tonight, but we don’t give a ruck. We’ve got work to do! Read more about this month’s rucking challenge here. We’re meeting on the large platform just up the steep incline on the Brooklyn side of the bridge. We’ll walk across to Manhattan and then round the southern tip of the island, finishing up at Clinton Hall. RSVP now! You can also view all the photos from last week here. Read the recap below! Twas maybe the sweatiest Monday ever! 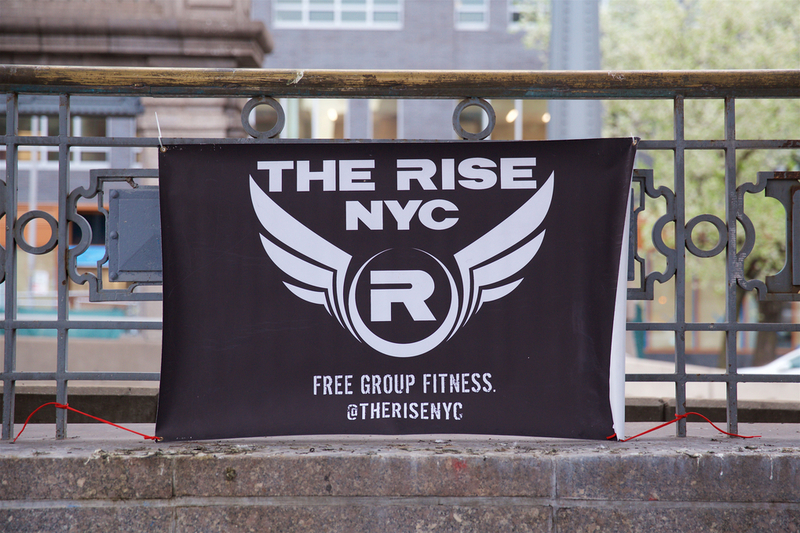 New and old Rise friends showed up to Washington Square Park to start their week off with high intensity in high heat! We were too busy sweating during the workout to take a ton of pics – just a group shot! Join us every Monday at 6:30 AM – Washington Square Park! Tuesday’s workout was explosive – and it wasn’t even the 4th of July! Every Tuesday at Grand Army Plaza – we’re there! The Queens Warriors tapped into their inner Superman and soared above MacDonald Park! And by “soared above” we mean “laid on our stomachs”. As usual the workout was tough and sweaty. Lots of core work and lots of high fives! Join us every Tuesday at MacDonald Park. 6:30 AM – as always! Tuesday’s five mile ruck took us from Columbus Circle, through Central Park and over to the West Side, where we wrapped up at the 79th St. Boat Basin Cafe. Smiling our way through Central Park! We we surprised with a TON of free food at the basin! The vendors were closing up and they had plenty of leftovers. A friendly group next to us also ordered too many slices of pizza. It was a good night. Pretty sure Jessica still hasn’t finished all the food she took home. We also just missed a crazy rainstorm that rolled in that afternoon! That’s the luck of the ruck for ya! Remember – our next ruck is TONIGHT. RSVP! For our Core Body Boot Camp workout, we focused on our abs with a sprint plank pyramid and an ab routine as our finisher. A big crowd came out to enjoy New York City at the best time of day! Rise up every Wednesday in Bryant Park! The Kings of Queens were at it again on Thursday! Squatting, dipping, and a ton of high fiving. We rock it every single week. Join us every Thursday in MacDonald Park – 6:30 AM! Friday was our Anything Goes workout! 40 squats, sprint to the trash can, run to the graffiti wall, or 30 flutterkicks. The cards decide! After about 25 minutes of letting the virtual deck decide our face, we did two final trash can sprints as a group. No better way to wrap up a Friday morning! On Friday we teamed up with a running club called “Friday Nights We Run” for a joint run/Rise workout/BBQ/high five social! The night began with a five mile run from Fort Greene Park to Brooklyn Bridge Park and back. Then we took on a “Rise-abella” seven minute Rise circuit to wrap up the fitness portion of the evening! What followed was a workout of our stomachs. We didn’t take a lot of photos, but we have evidence that we hung out past dark! Looking forward to our next collaboration with the Friday Nights We Run crew!